OPETH - HERITAGE (CD) | Online Shop | Wizard LTD.
Opeth has spent over two decades steadily amassing a body of work that is at once possessed of a fervent and unrelenting devotion to aesthetic progression (and perfection) while simultaneously scaling the summits of power, mysticism and might aspired to by the group&apos;s hard rock forefathers in Sabbath, Purple and Zeppelin. The band&apos;s roots in the doom-laden shade of occult-infused Scandinavian death metal and dark romanticism are undeniable and will never elicit apology. 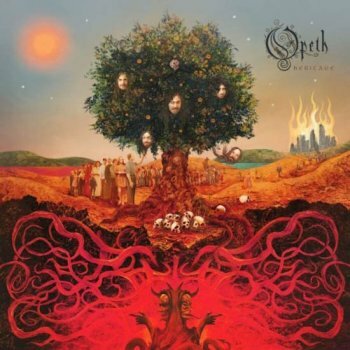 But the transcendent emotional and melodic heights achieved on the brilliantly titled tenth full length Opeth album, Heritage, marks a new chapter in the storied quintet&apos;s career. Band leader, singer, guitarist, songwriter and long-running consistent member Mikael Еkerfeldt has reshaped the pathway forward for his artistic vehicle without sacrificing the hard won spiritualism of previous endeavors.